Head gasket repairs, valve adjustments, camshaft timing, carb and SPICA fuel injection tuning, and driveshaft donut replacement are all explained. Experienced, hands-on guidance thatll keep you in the drivers seat. Few cars evoke the passionate experience that comes with owning an Alfa. Accelerating at 100-rpm increments just to hear the exhaust note. Admiring the sensuous body styling and engine castings - so often copied in the designs of lesser cars. Alfas can also be demanding, frustrating cars to own. They are not so much unreliable, as difficult to understand and troubleshoot when problems do arise. Alfa Romeo Owner's Bible gives you precisely the kind of experienced information you need to serenely buy, maintain and drive an Alfa. Head gasket repairs, valve adjustments, camshaft timing, carburetor and SPICA fuel injection tuning, and driveshaft "donut" replacement are just a few of the maintenance and repair procedures explained and backed up with hundreds of step-by-step photos. You will also find expert advice on things you should know when buying a used Alfa - where to look for rust, or signs of neglect or abuse - plus high-performance tuning for street and track, choosing accessories, and fascinating marque history. 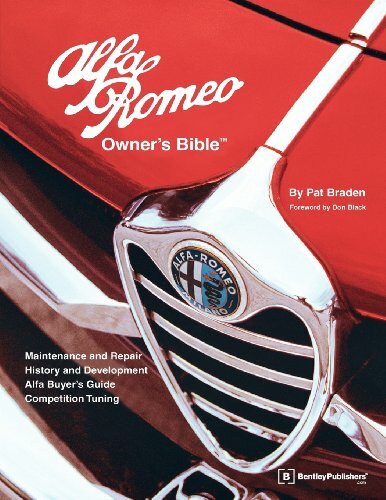 Author Pat Braden owned and maintained more than 50 Alfas and was a columnist and former editor of Alfa Owner magazine. This is the only book that provides you with the experienced, hands-on guidance you need to keep you in the driver's seat.